The keynotes were inspiring. 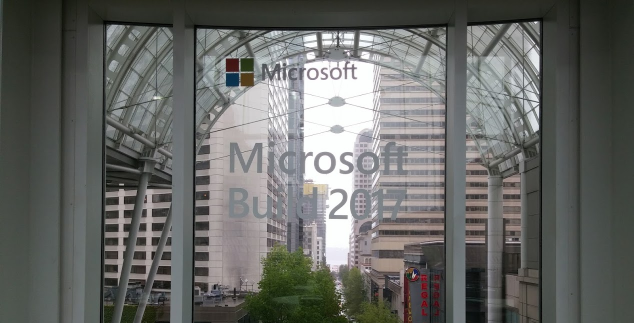 Obviously, this is pretty deliberate since Build is, first and foremost, about steering developers and companies toward Microsoft’s platforms. The move toward Azure leads to vendor lock-in. I don’t say that to be negative, as it makes sense for Microsoft. Some of the key new features of Azure such as Azure Functions/Logic Apps with Serverless functionality are compelling. I could see myself using this soon. SQL as a Service also is something that I’m eager to utilize immediately. Hosting, for example, a MySql instance in Azure without a VM or MySql In-App is something I want to try out. Speaking of databases, Cosmos DB looked interesting. If nothing else, its scalability is impressive. I’ve never had occasion to use a Document DB, though. Containerizing applications is still in full swing. The demos showing debugging in Visual Studio of multiple containerized applications, simultaneously, impressed. Azure Service Fabric has been updated to fully embrace running containerized applications and micro services. There is a lot of talk of IoT devices and, especially, Azure IoT Edge and Azure Stack. These are pretty neat technologies as they can push functionality that would typical live in the Azure Cloud space down to IoT devices and local “Stack” appliances for those times when the internet may not be available. The IoT Edge concept is interesting because it can replicate functionality that typically lives in the Cloud, but the IoT devices and run whatever code locally, thus eliminating the persistent need to go to Azure for every thing. Maybe that reduces costs, downtime, and such. The subscription is not registered to use namespace 'Microsoft.Storage'. I don’t know if that means my MSDN account doesn’t have this feature available or if I need to manually add the storage provider. My playing kind of stopped there. Other things I tried out, such as the new Azure mobile client for management are pretty decent. Another big push is the 3D/Virtual Reality space with HoloLens. It seems like an OK product, but I don’t have any practical use for it in my day-to-day work. I could see myself using it for personal or side-projects, though. Bots were still big news. Cognitive services, especially using cameras and AI to detect objects, provided impressive demos. I still lump these two things into the category of “how would I use them for my employer?” category, but they look cool. Visual Studio for the Mac was big news. It didn’t really interest me since I don’t use a Mac, but I did ask if there would be Visual Studio for Linux. Apparently, Microsoft is open to feedback and if enough people were interested, Visual Studio for Linux is a possibility. On the Windows front, Microsoft is now touting a new UI Design paradigm called Fluent Design. It seemed a lot like Google’s Material Design to me. Something else that I randomly bumped into was the new Desktop Bridge. Supposedly, it can take even old WinForms 2.0 applications and convert them to UWP applications. I chatted a with a lot of the respective representatives at the Microsoft booths about everything from changes to Microsoft Healthvault to the new features in .NET Core 2.0. That reminds me, .NET Core 2.0 and .NET Standard 2.0 look really good and improved. There are Preview builds available, but I think I’ll wait to try them out when they are stable. All in all, there was a wealth of information and news, that it will take a fair bit of time to disseminate and sort through. I have a lot of work to do.